Ice Buckets and Wine Coolers hand painted to chill your favorite beverages and wine are a great addition to entertaining. These ice buckets and wine coolers make great anniversary, wedding and birthday gifts custom made and personalized for that special someone. We hand paint any design. We offer acrylic or crystal ice buckets and our crystal wine coolers look great on any dining room table or bar. 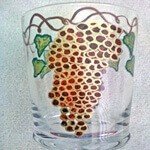 Hand painted Crystal Wine Coolers "Tree Of Life"